If you are just stumbling in to my blog today, don't forget to go back to the QKD blog to start the blog hop. Today, there's a sketch (which I had to fudge because of the size of the image I had to use) and we are showing off the new releases that will be available on Wednesday. This new release stamp is called Awaiting the Moment. How sweet is that? 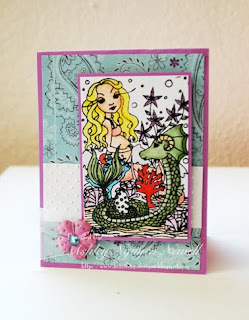 I love this mermaid from darling Maigan! I colored her with my Copics. The background paper is Deja Views. The white paper is embossed with the Swiss Dots folder. The flower is a Prima and the bling is Darice. Great coloring. Love all of the detail! This is STUNNING! just wonderful Ashley! WONDERFUL! The stamp is gorgeous and I love what you did with it.